So Simple It’s Silly is a series of incredibly easy sweet and savory recipes. Minimal ingredients, great short cuts and not at all time-consuming. I originally wanted to call this BROASTED Chicken Wings, but upon further research, a Broaster is a high-end quick cooking deep fryer and all I really did was roast my chicken wings at a very high temperature. So I suppose it’s not really broasting but HRoasting! Yes, I just made that up, but what is cooking if not fun right!? 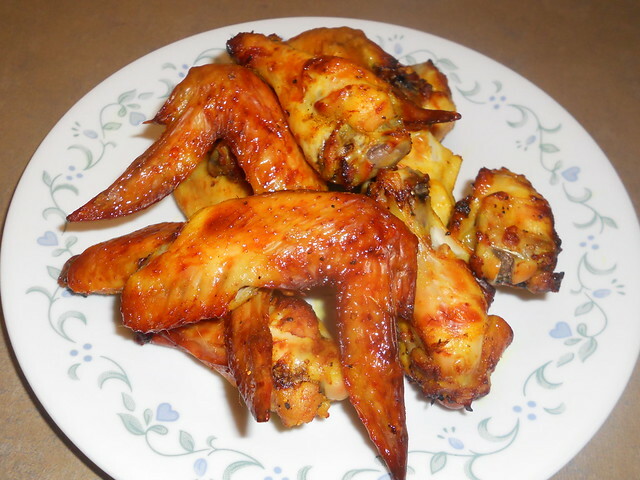 HRoasting is roasting at a very high temperature so the skin carmalizes, crisps up very well and promotes that gooey collagen rich eating experience from the fatty chicken wings. marinated the wings the night before in a quick spice paste, and I usually fry my wings, but tonight, to be more health conscious (and because the baby brother refuses to eat fried items), I HRoasted these bad boys for 25-30 minutes in the oven for a quick weekday family meal. Accompanied by hot steamed jasmine rice, spicy peanut sauce (or no sauce at all, since they’re very well-flavored) and an ice-cold beer. Perfect no-fuss weekday meal for the lovely weather we’ve had lately. 1. In a large bowl with a cover, add all ingredients between lemongrass powder to black pepper. Mix with fingers to create a paste, add a bit of water at a time to loosen paste to a consistency of a runny pudding. 2. 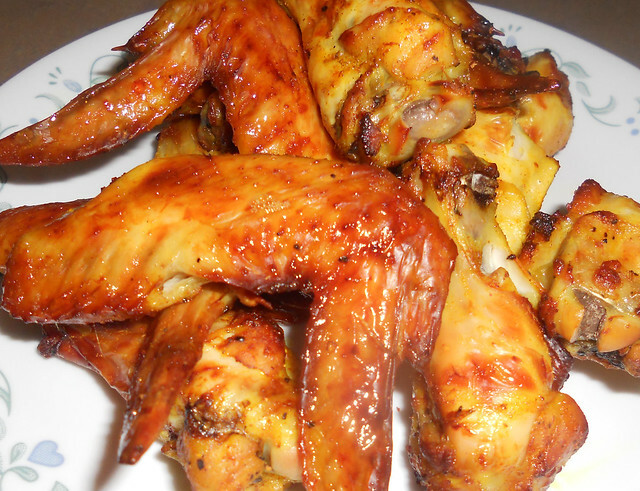 Add washed and sectioned chicken wings to the bowl and toss thoroughly to cover with paste. Adding a bit more water if paste isn’t loose enough. Cover and allow to marinade over night. 3. Preheat oven to 425 degree. Place a cooking rack in a baking pan lined with foil and spray cooking rack with a non-stick cooking spray. 4. Line chicken pieces on the baking pan, close but not touching, the space between will allow the chicken to evenly roast and not steam. 5. HRoast for 25-30 minutes, flipping the chicken once half way through. 6. Allow to rest for 10 minutes before enjoying. The skin is crisp, the meat will be tender and juicy and the spices just enough for a subtle kick. 1. Don’t over crowd your cooking rack, cooking in batches if you must or use 2 baking pans. Over crowding causes the chicken to steam versus getting that beautiful roasted skin. 2. Although I’ve roasted the chicken in this instance, this recipe is amazing fried, grilled or even baked. 3. In a pinch, I do use powders, but I prefer fresh ingredients to them, feel free to substitute for fresh lemongrass and galanga if you have them on hand. I hope you enjoy this super simple chicken recipe, this was just something I threw together last night when I was staring at a big bowl of chicken wondering how I would marinade it for tomorrow’s dinner. Cooking has always been like that for me, fun and no-fuss, when you know flavors, everything just seems to come together beautifully!